While many books are dedicated to individual aspects of nanofabrication, there is no single source that defines and explains the total vision of the field. Filling this gap, Nanofabrication Handbook presents a unique collection of new and the most important established approaches to nanofabrication. Contributors from leading research facilities and academic institutions around the world define subfields, offer practical instructions and examples, and pave the way for future research. Helping readers to select the proper fabricating technique for their experiments, the book provides a broad vision of the most critical problems and explains how to solve them. It includes basic definitions and introduces the main underlying concepts of nanofabrication. The book also discusses the major advantages and disadvantages of each approach and offers a wide variety of examples of cutting-edge applications. Each chapter focuses on a particular method or aspect of study. For every method, the contributors describe the underlying theoretical basis, resolution, patterns and substrates used, and applications. They show how applications at the nanoscale require a different process and understanding than those at the microscale. For each experiment, they elucidate key solutions to problems relating to materials, methods, and surface considerations. A complete resource for this rapidly emerging interdisciplinary field, this handbook provides practical information for planning the experiments of any project that employs nanofabrication techniques. It gives readers a foundation to enter the complex world of nanofabrication and inspires the scientific community at large to push the limits of nanometer resolution. Stefano Cabrini is director of the Nanofabrication Facility and member of the interfacility nanophotonics group and the "single digit nano fabrication" theme in the Molecular Foundry (a U.S. Department of Energy program) at the Lawrence Berkeley National Laboratory. His research interests include nanophotonics and metamaterials, semiconductor device fabrication, optical device fabrication, MEMS fabrication, and the development of new lithographic tools and processes. Satoshi Kawata is a professor of applied physics at Osaka University, chairman of Nanophoton Corp., and chief scientist of the Nanophotonics Laboratory at RIKEN. A fellow of the Optical Society of America, SPIE, and Institute of Physics, Dr. Kawata has been a recipient of the Medal of Purple Ribbon from the Japanese Emperor; the Science and Technology Award from the Japanese Ministry of Education, Culture, Sports, Science and Technology; the Da Vinci Award of Excellence from LMVH Moët Hennessy Louis Vuitton; and the Japan IBM Science Award. His research interests include nanophotonics, biophotonics, plasmonics, metamaterials, photonic crystals, and nanofabrication through two-photon absorption techniques. "[T]his book goes beyond the description of most nanofabrication techniques to present several practical applications. … the profuse use of drawings, illustrations, and pictures will help the reader visualize what is explained and discussed throughout the text. … both the fundamentals and practical applications related to nanofabrication by lithographic techniques are well covered." "… expertly integrated … The book is suitable for researchers and engineers in a variety of disciplines. I highly recommend it as a comprehensive introduction to nanofabrication techniques." 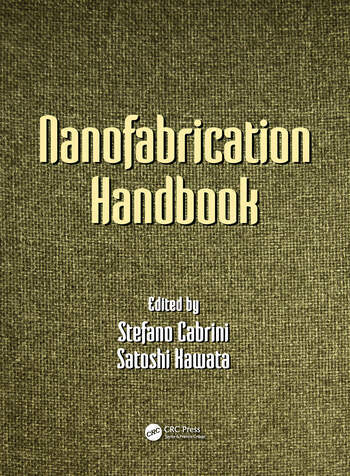 "Nanofabrication Handbook is a broad topical introduction to nanofabrication methods and applications. It is rich with illustrations and the authors of the individual chapters have made a real effort to introduce readers to the basic concepts in understandable terms while also capturing the current leading edge in their field. 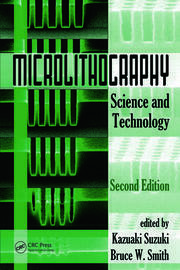 The amazing micrographs of prototype structures that are documented throughout the pages offer an inspiring snapshot of the many and varied accomplishments of the researchers working in these technology development and application fields … The style used by the authors will allow this volume to serve as a solid introduction to methods in current use in nanoscale research while the breadth of topics will also permit experienced practitioners to learn about methods and applications outside their own areas of experience." "An impressive work covering all the important nanofabrication topics and contents … Highly recommended."